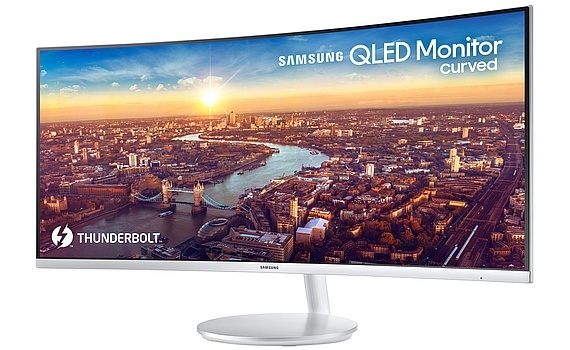 The Samsung CJ791 QLED curved monitor has a 4 ms response time and can provide up to 85 W of laptop charging power via the Thunderbolt 3 interface included, which can also provide up to 40 Gbps transfer rate when connected to various peripherals. Samsung has a new monitor ready to hit the market and will unveil it later this month at the CES 2018 trade show in Las Vegas. Simply known as the Samsung CJ791, this 34-inch curved QLED monitor is the first of its kind to feature Intel Thunderbolt 3 connectivity and targets both the entertainment and business sectors. Sadly, there is no launch date or a price tag to talk about yet. Fortunately, those interested in seeing the Samsung CJ791 monitor in action can do so between January 9 and January 12 in Las Vegas. The CJ791 will be at Samsung's CES booth #15006, located on Level 1 of the Central Hall in the Las Vegas Convention Center.